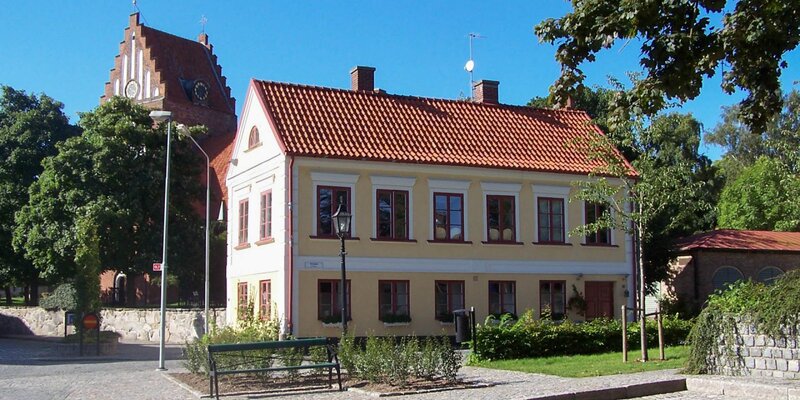 Listers Härads Tingshus, the former building of the District Court of Lister, is located in the center of Sölvesborg. 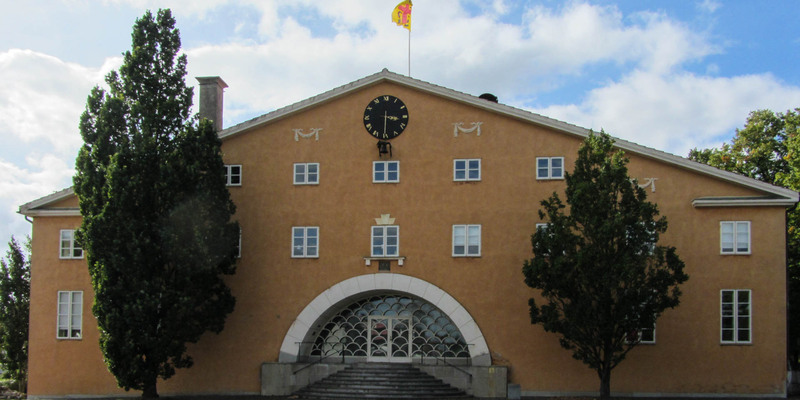 Among architecture students, the building is one of the most famous buildings in Blekinge because it was designed by Erik Gunnar Asplund (1858-1940). The courthouse was built in 1920/21 and is an early example of the 1920s-Classicism. The award-winning architect Asplund gave Listers Härads Tingshus a monumental look, although the building is not particularly large. The facade of the plastered brick building is designed rather plain and directs the viewer to the entrance with a wide staircase and a large semicircular archway with segmented glazing. It is inspired by the main entrance of the station building at the other end of the street. Asplunds was also interested as an architect in interior design. So, he designed the interior of the courthouse, furniture, tables, clocks and judges panel, too. The round shapes of the woodwork and windows where inspired by the pregnancy of his wife during construction. When Erik Gunnar Asplund won the contract for construction of the new courthouse he already was known for building Skogskyrkogården (forest cemetery) in Stockholm which is a World Heritage today. Construction start of Lister Härads Tingshus because Sölvesborg became much larger than the town Norje, where the district courthouse was situated in the Norje Tinghus since 1795. 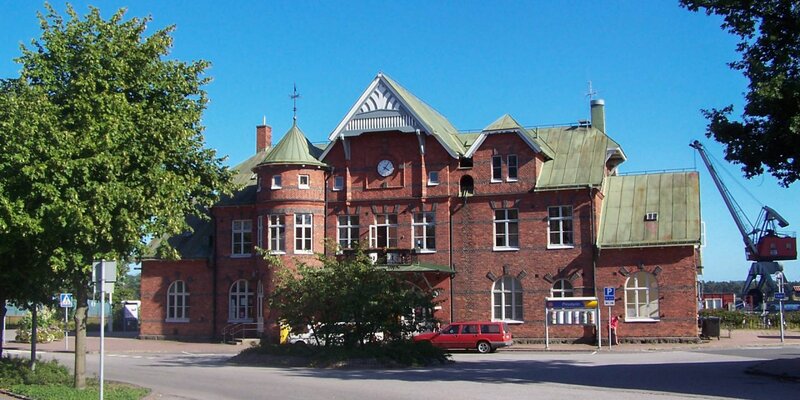 The court is relocating to Karlshamn and the building is vacant for four years. In 2005, the Sparbank buys the former courthouse and gives it to the city with the order to use it as a cultural center. 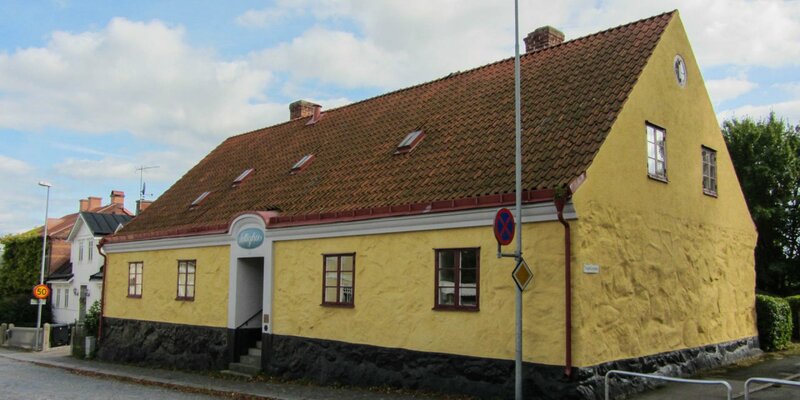 There were many voices in Sölvesborg who held the design for the ugliest building in the city. Fortunately the chosen site of the new courthouse was outside the former city planning, otherwise the mayor and building authority could have prevented the new building. The construction costs, initially estimated at 200,000 crowns, totaled in about 350,000 crowns. Nowadays, the building is a permanent destination of the excursions of architecture students from around the world. The courthouse is one of 40 realized designs from Asplund, who was not exclusively an architect but also a successful designer.